Q. Was the key today that you played better the big points, saving all the breakpoints? RAFAEL NADAL: The difficult matches always decides, yes, a few balls. For sure I saved all the breakpoints. The most important one was the 3 All, 15 40. That was the most important on the match because I know after that I play with new balls. That is better for me because the bounces are higher and more favorable for me, and with the wind in my favor. That was probably one of the keys of the match. And then I did a few things well. Is always difficult to play against Gilles. Is always smart on the court and he knows how to play tennis. Very happy. Was a very difficult victory for me, and I did. So fantastic being in another final. Q. How important is tomorrow for you after seven defeats with Novak, and seven wins here in Monte Carlo for you? Is it a match like any others or not?RAFAEL NADAL: When you lost seven, don't nothing if I lost eight. That's the real thing, no? You lose seven or eight, doesn't change a lot. First one is a lot. Second is 50% more. So now 10% less every time. The pain is less, too. Q. Are you sure the pain is less?RAFAEL NADAL: Sure. Finally you accept and you keep fighting. Is an important match. But for me be in the final is a fantastic news at the same time. That give me calm start the clay court season like this. Don't forget that few weeks ago I didn't know if I will be here playing or not. Seven days ago I was practicing here for the third day just after 15 days without touching the racquet. Today I'm in the final. My feeling is I have much less to lose than him. I have everything to win. That's the most important thing. That's the only positive thing about losing seven times. The next matches, you only have to win. You go to the match knowing that the normal thing is lose but trying the best to change situation. That's what I going to try. I would love to play that match two weeks later. Q. What does it mean for you to go to an eighth final in a row here after the problems you have with your knee?RAFAEL NADAL: Is a perfect way to start the clay court season, be in the final without losing a set, playing especially yesterday and today matches against two tough players. It means a lot to start another clay season with a final. Now remain the most difficult thing. I am here to try. If not, I'm going to go to Barcelona knowing I played four matches here with the right level. The clay court season is short but at the same time is long. I have time. I need to improve physically because I didn't have the chance to practice physically for the last 15 days. I had to be without practice, the physical performance, in and out of the court. So matches like today help me a lot to be more fit for the next tournaments. That's very important for me. Today and yesterday I had two tough matches. You get the performance physically on court. Q. Do you hope for a windy day tomorrow?RAFAEL NADAL: Windy day? Q. You come from an island. Maybe. RAFAEL NADAL: No, no, no. I prefer with the normal conditions. I prefer to play normal tennis. Doesn't matter. I going to accept if there is windy. If windy, try my best in every moment. If I lose, I going to shake the hand like the other seven and go home. If I win, I'm going to be very happy. But I have the calm that I won here seven times already. That means a lot to me. Will try tomorrow for the number eight. But seven is much more than what I ever thought. Q. You say that Novak is the favorite tomorrow because you have not enough training sessions. RAFAEL NADAL: No, no. I said he's the favorite because he beat me the last seven times, not because I don't have enough training sessions. Seriously, I will like to play this match a few weeks later, but not for the reason he's the favorite. When one player beats another one seven times in a row, clay, hard, and grass, is very easy to decide the favorite. Q. You talk about the physical condition. The kind of story we had in Melbourne with the physical condition. Do you feel better now?RAFAEL NADAL: You look me bad in Melbourne? Q. You made it to the finals. RAFAEL NADAL: But like the physical or tennis performance? RAFAEL NADAL: I play six hours, the final. Q. Do you feel better now than you did in Melbourne?RAFAEL NADAL: Better, no. I feel worse than in Melbourne. I feel worse. In Melbourne I didn't have a problem physically for last month. I was able to practice. I played five set matches, four sets against Berdych, four sets against Federer. That's a lot of preparation to play a final like I did. Here I played four matches, but straight sets. Demanding ones only yesterday and today. More today. But we'll see. That's always tough to talk. Because you have to write, I'll talk that much. Q. Will you try something different tomorrow?RAFAEL NADAL: What can I do? Q. I don't know. That's my question. RAFAEL NADAL: Some innovation (turning hand upside down). Q. Play more aggressive?RAFAEL NADAL: Is the only way to win, play more aggressive. I know that. At the end, you cannot change your game a lot, no? I don't have that talent to change a lot my game. I have to change a few things, like I did in Australia, like playing more aggressive, trying to go for the point. I was very happy after my match, the way that I played there, no? I will try to keep trying to play aggressive. I think is the only way. I said there that I was in the right way to try to win against Novak and try to have a perfect year. I was a little bit unlucky with the knee, especially in Miami. But before Indian Wells I have little bit problems, too. But, you know, finally played four tournaments in normal conditions this year, and I did one final, two semifinals, and another final here. So I am doing very well in my opinion. Just remain a few things. This week hopefully going to help me for the next weeks on clay. And tomorrow is a match that will be a fantastic test for me, and I have to play aggressive. I know. I have to try to return longer and try to have the position on the court more inside than today and yesterday, try to have the control of the point from there. If not, is impossible to hit winner against Novak from behind the baseline because his movements are too good. Q. Even if you lost seven times, the two matches you lost on clay are one year ago. You were not playing at your best when you lost in Madrid and in Rome. I don't know what you think. RAFAEL NADAL: Sure, you are free. Yes, but don't forget that last year I get injured in Australia, and after I played final in Indian Wells, final in final Miami, champion Monte Carlo, champion Barcelona, final Madrid, champion Roland Garros, final Wimbledon. So for my level, that's a very good season. I must be playing really well to have the results. Seriously, I don't consider myself that good to do these results without play my best. Probably against Novak I didn't play my best, yes. But that's for any reason. And probably the reason was him, you know. Because against others, I was able to play well and don't lose a match against the rest of the players. So the reason to play bad against Novak probably was because he make me play bad. Q. Did you see the match of Djokovic today with Berdych?RAFAEL NADAL: I saw the match, yeah, sure. Q. 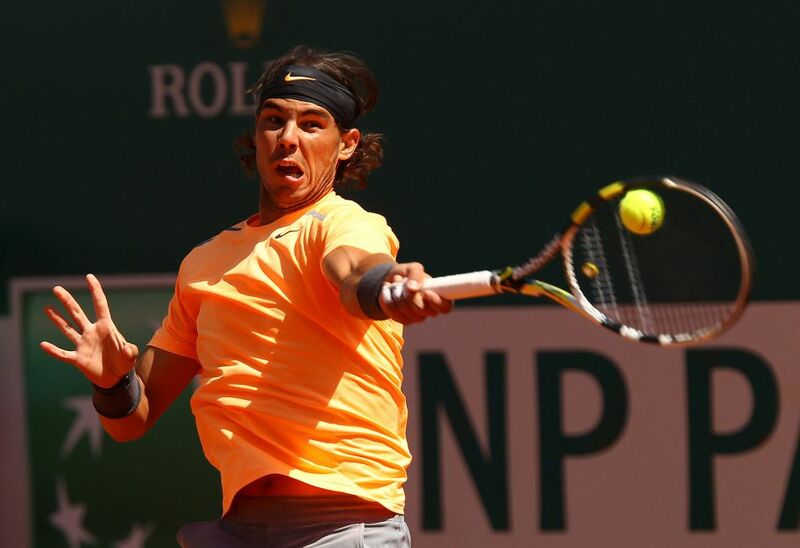 What's your opinion about it?RAFAEL NADAL: I think Novak had the control of the match in the first set with the 4 2. He had a few mistakes. He played two bad games. Then Berdych play very well. The beginning of the second set was too important. The first three games of the second set can be totally different history, but was 3 Love for Novak, and that's the match. The match finished there, in my opinion.